Vidyagyan School Entrance Exam 2019:- VS School entrance exam conducted on December 2018. Students will be selected from Low Class income family who unable to give complete education to third beloved children. 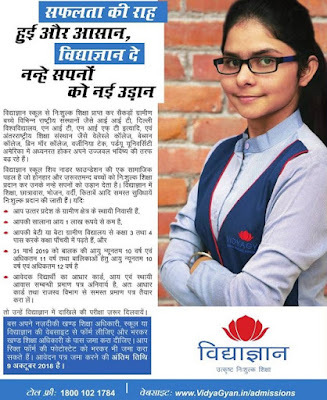 Vidyagyan School Shiv Nadar Foundation: - Vidyagyan School Admission scheme is supported by Shiv Nadar Foundation who called themselves as Social Welfare Authority. Vidyagyan School will give all types of facility in respected School/College such as IIT Delhi, NIAFT, International Education Institute, Wellesley College, Born More College, Virginia Tech and other colleges in America. Certificate: - You should belong to domicile candidates of Uttar Pradesh. Income Minimum income of Parents should be Rs 1 Lakh. Eligibility Criteria: - You’re Daughter or Son should have studied in Village school and currently taken education in 3rd, 4th and 5th. Age Limit of Boys should be minimum 10 years and maximum 11 years. Girl’s age limit must be minimum 10 years and maximum 12 years. Age Limit calculated as on 31st March 2019. Document Required: - Applicants should attached all types of document important to apply or taking free education scholarship. How to Apply: - Interested and eligible candidates should fill up form of Vidyagyan School & submit it to Khand Shiksha Adhikari before 9 October 2018 (Last Date extended to 31st October 2018). Opening date of Vidyagyan Scholarship Registration: - 8 September 2019. Last date to fill form":- 10 October 2019.